I try not to use such adjectives as “the best ever” to describe my recipes. You know, everyone’s tastes are different, and what is “the best” for me, may not necessarily appeal to you. Plus there are so many great recipes out there, that it is impossible to single out just one– they are all good in their own way. These pancakes are an exception to that rule! Once I discovered them, I stopped searching for that perfect pancake recipe. They come out fluffy and flavorful enough to be eaten on their own, as opposed to the bland kind, that only serves as a vehicle for syrup or jam. Another big plus of this recipe is the ease of preparation. 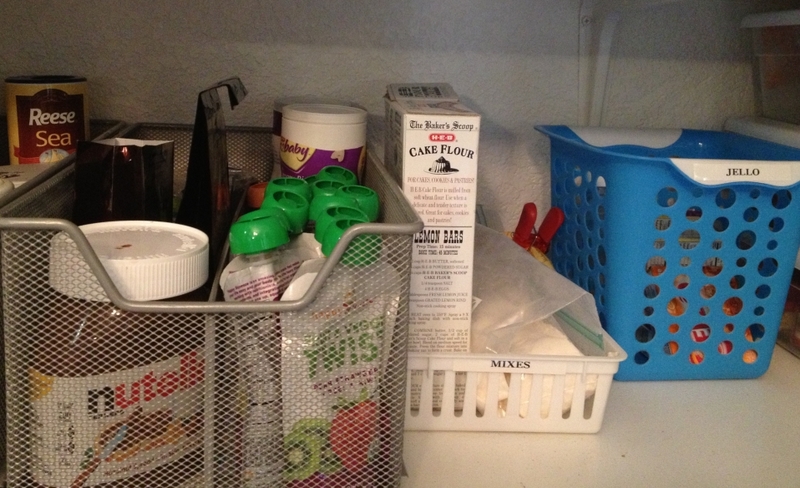 I use home-made mix that I make in advance and store in the pantry. Whenever we want pancakes, all I need to do is melt some butter in the microwave, add eggs and buttermilk, and the pancake mix. Honestly, is it harder or more time consuming than using a commercial pancake mix (to which you are still supposed to add eggs, milk and oil)? I think not at all! 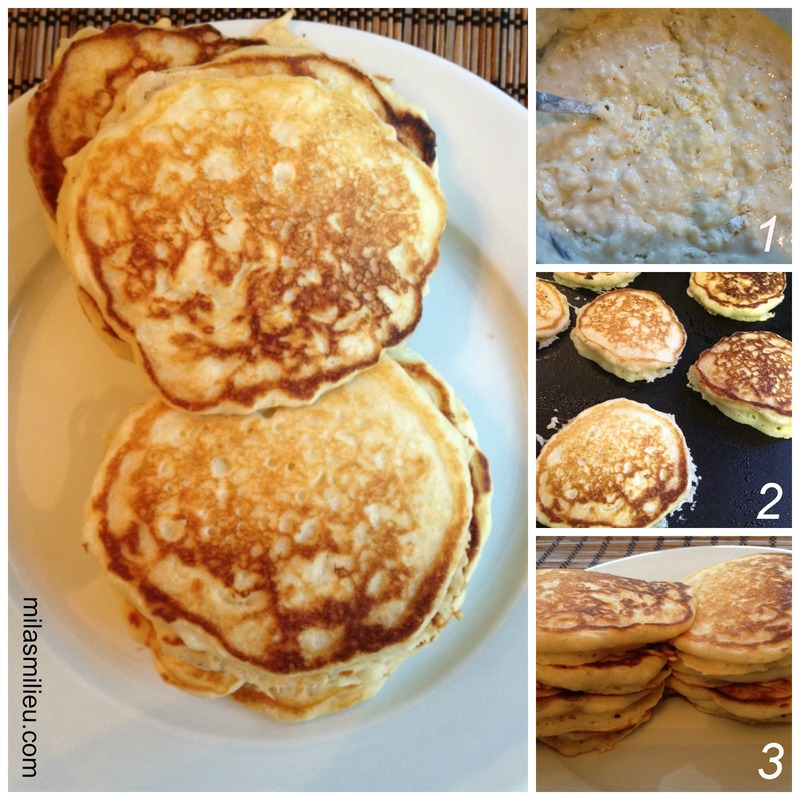 I stopped buying Bisquick type mixes, once I realized how easy it is to make my own, with a bonus of terrific melt-in-your- mouth flavor minus a long list of artificial ingredients and preservatives. Note on buttermilk: buttermilk is a magic ingredient! It keeps in the fridge for weeks, makes baked goods very moist and fluffy without the need for extra fat, and it is great for marinating chicken, or using in mashed potatoes. Here are my other low-fat recipes that use buttermilk: banana muffins, whole-wheat apple muffins, strawberry muffins. The recipe is slightly adopted from Alton Brown. 1. Melt butter in the microwave for 45 seconds. Add buttermilk,eggs, and vanilla. Stir everything to combine. 2. Add the pancake mix. Important: be sure to not over-mix your batter! 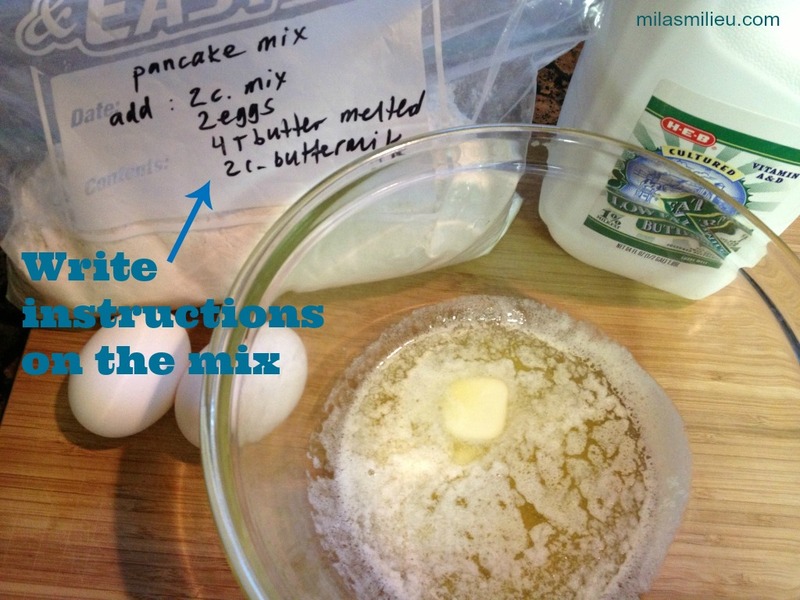 Over-mixed batter will result in tough pancakes. Stop mixing when the dry and the wet ingredients are just barely combined. Let the mixture sit on the counter for 5-10 minutes while your are preheating your pan/griddle: this allows the buttermilk to react with the baking soda in the batter. 3. Ladle the pancake batter onto the griddle and sprinkle on fruit if using. When bubbles begin to set around the edges of the pancake and the griddle-side of the cake is golden, gently flip the pancakes. Continue to cook 2 to 3 minutes or until the pancake is set. We freeze leftover pancakes for breakfasts during the week. To reheat, microwave 1 pancake for 20 seconds, flip, and microwave additional 20 seconds (adjust the time based on your microwave). 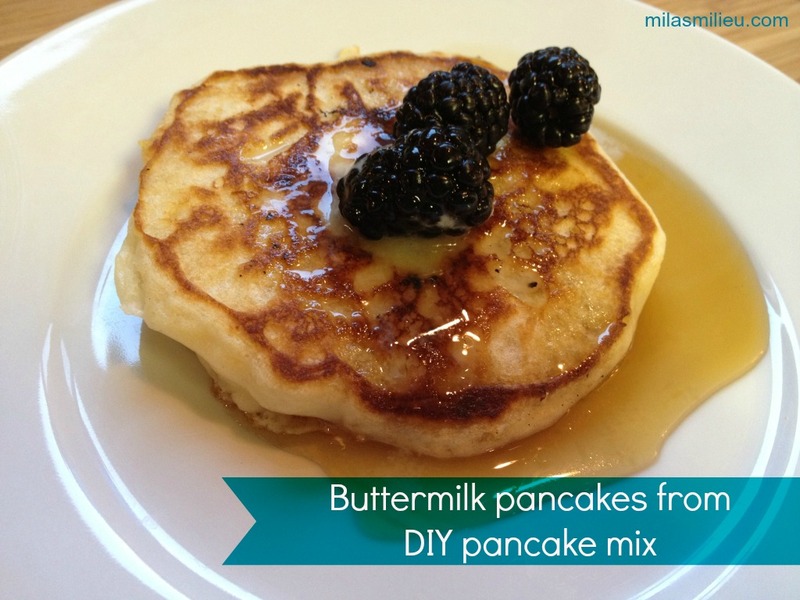 I hope you give some DIY Pancake Mix a place in your pantry, so you too could enjoy these wonderful pancakes any time (and remember to add buttermilk to your grocery list!). If you liked this post, feel free to share it using the buttons below. Definitely going to try this, Mila. Love the idea of eliminating artificial ingredients and preservatives, and they sound delicious! Hi Amy! I hope your family will love them as much as we do! Your pancakes look delicious, Mila! I want to make pancakes for breakfast now! Thanks, Meike! I hope you like them, if you decide to give them a try. They are very light and fluffy due to the buttermilk. Enjoy your weekend!